The easiest and quickest way to get started with Programmable Wireless connectivity for your IoT (Internet of Things) devices is to use Machine to Machine commands. 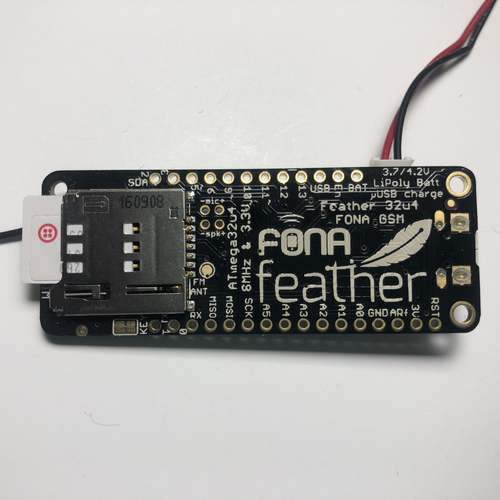 With the simple steps in this Quickstart, we will show you how you can send and receive text-based commands using the Adafruit Feather 32u4 FONA development board. While most of your code will be transferable, new product development for 2G in the United States is not a good choice. 2G networks in the United States are being deprecated. For new product development, we suggest researching alternatives or discussing your idea with the Twilio Programmable Wireless team. Sign up for a Twilio account. Purchase your first SIM cards for Twilio Programmable Wireless. Insert your SIM card into the Adafruit Feather 32u4 FONA development board. Power and flash the board. Send a Machine to Machine command from the Adafruit Feather 32u4 FONA and read it in the Wireless Console. Receive a Machine to Machine command on the Adafruit Feather 32u4 FONA. Adafruit Feather 32u4 FONA development board, which is an Arduino-compatible board having audio/sms/data capable cellular capabilities. Not the quickstart you were looking for today? See our other Programmable Wireless quickstarts or see all Wireless resources. I've gathered the hardware - now I need to get my SIMs! Already have a Twilio account and a SIM card? Skip ahead to the register and activate step by clicking the button at the end of this section. 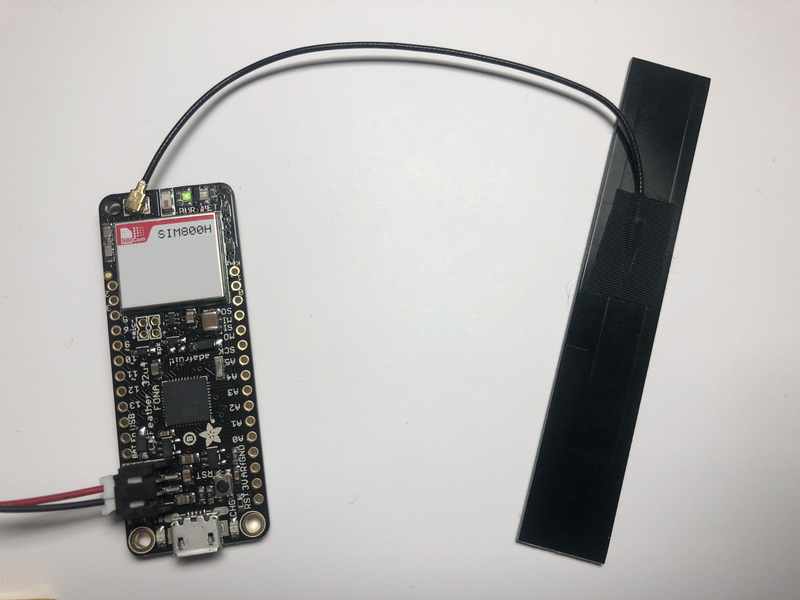 Before you can connect with Twilio Programmable Wireless, you'll need a Twilio Account and a SIM card. Sign up for a free Twilio account here. Open the Console and from the Programmable Wireless menu, click Orders. On the Order SIM Cards page, enter your details (Order Details, Delivery Address, and Payment method), and then submit your order. Orders of 10+ SIMs will be delivered with the SIM cards already registered to your account. Detailed information about ordering SIMs is available here. I've got my SIMs! How do I register and activate a SIM? Once you receive your SIM shipment, pick a favorite and unpack it. Next, pick a distinct Unique Name for this SIM. Select a Rate Plan from the options provided by Twilio. We have created data metering quotas that are optimized for both high and low usage devices. You can use our data usage estimator to find the right Quota for you. Rate Plans also let you control every aspect of what your device can do with data, voice, and messaging. For this quickstart, you can choose a low volume plan but ensure the plan you choose includes messaging. When you're happy with the name and plan, Activate the SIM card. Detailed information about registering and activating SIMs is available here. I'm active! Let's plug things in and get ready to connect. If your module does not come with a PCB (onboard) antenna, you need to connect the antenna to the board. If you are unsure, check for an antenna included with your module or read the documentation included with your purchase. Punch out your Twilio SIM card and, if necessary, insert it into the slot on the module. Be very careful to get the orientation correct with the SIM card insertion. If you are unsure of the correct side to insert, look for a diagram on the housing or the board showing the layout. 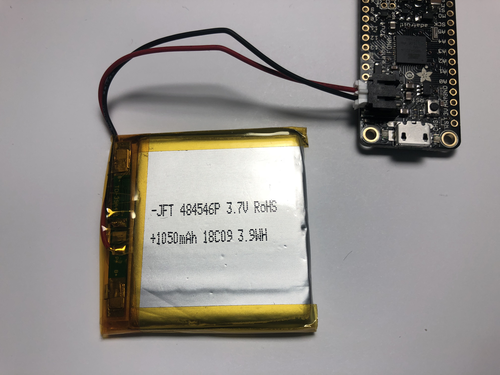 Locate the JST connect and plug the Lipoly Battery into the board. The battery must be plugged in at all times for connectivity to work. Download the Adafruit_FONA library by Adafruit. 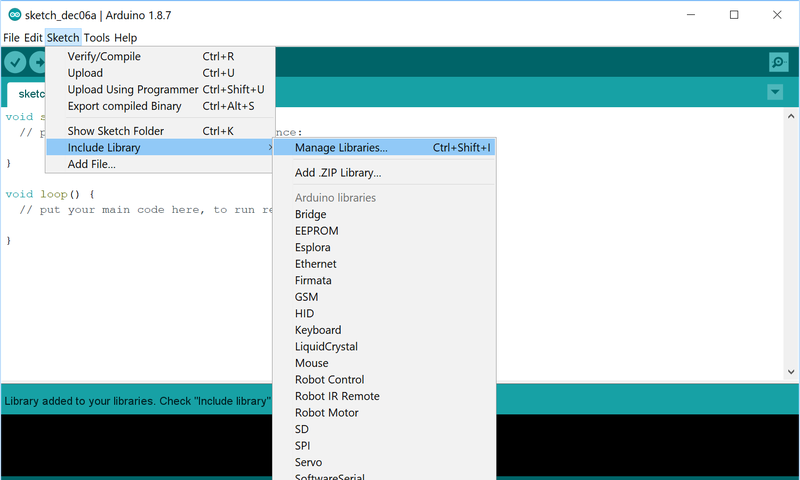 In the Arduino IDE add the newly download .ZIP to your Library folder by going to Sketch > Include Library > Add .ZIP Library. 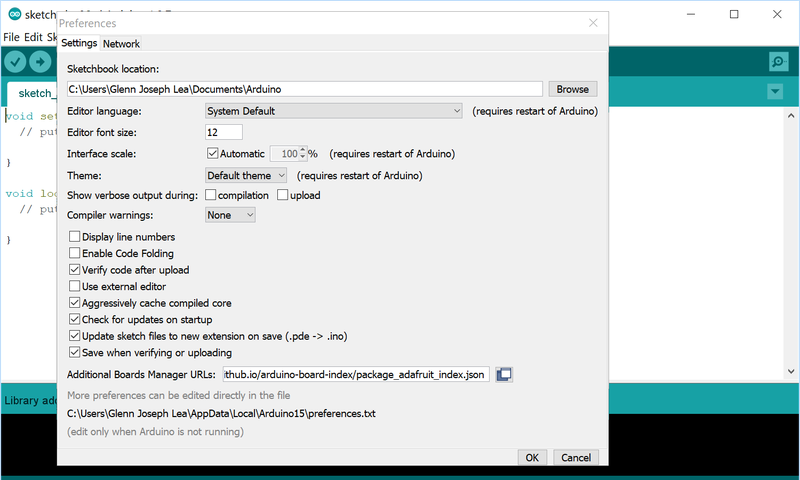 In the Arduino IDE, select File > Preferences. From the Tools menu, select Board > Board Manager. 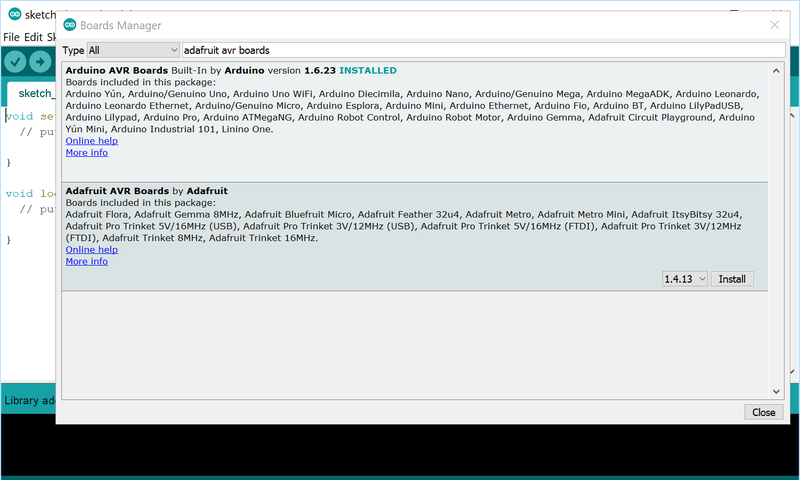 Search for the Adafruit AVR Boards package and install the package. Whew, that was a rush. Let's program the Adafruit Feather 32u4 FONA. You can download the code directly from this directory on Github. Load the file m2m_command_feather32u4fona.ino into the Arduino IDE. Alternately, you can copy/paste the code into a new Arduino sketch using File > New Sketch. Power your Adafruit Feather 32u4 FONA by connecting it to your computer using a USB cable. Wait for a few moments. 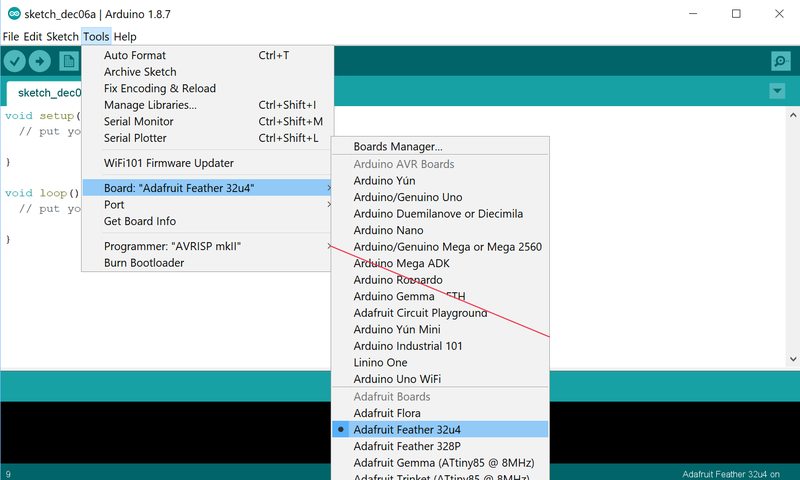 Then in the Arduino UI, select your board and the serial port it enumerates from Tools > Board > Adafruit Feather 32u4 FONA. Another is to select Upload from the Sketch Menu. While the board receives your code, open the Serial Monitor from the Tools menu. If you don't see the above, make sure the power is connected and you have set the speed set to 115,200 baud. Power cycle or hit the reset button on the Adafruit board to have it spin through again. Let's look at how the message was sent in the next section and then prepare to send a response from our computer. How did you send the M2M command? 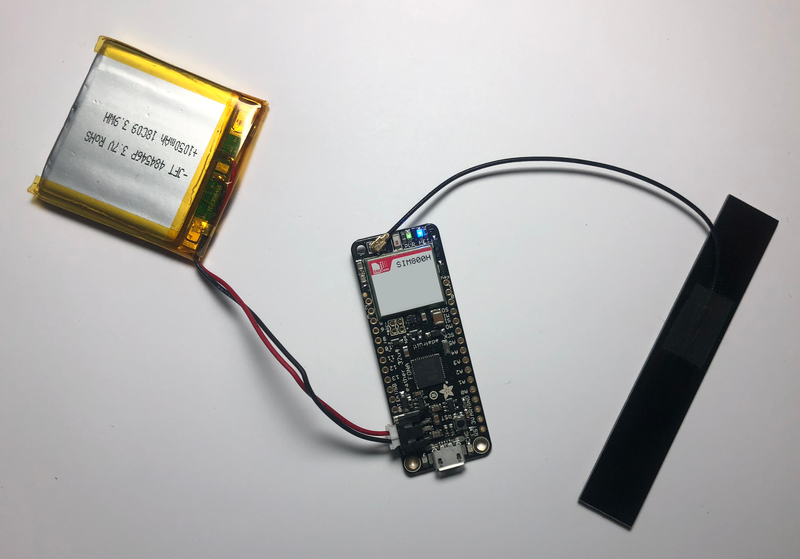 Sending an M2M Command with the Adafruit Feather 32u4 FONA using the helper functions provided. Behind the scenes, we send an SMS to the shortcode 2936. The easiest way to check the command was successful is through the Programmable Wireless Console. From the Console, select SIMs from the Programmable Wireless menu. Click the SIM you are using for this project, then navigate to the Commands tab. As you might guess, we will implement the reverse - you'll receive an inbound SMS from 2936 on the Arduino triggered by an API call using the SIM's Sid. Let's look at that next. Cool, show me how to receive a M2M command. Sending (or in this case, manually responding to) a Machine to Machine command is very straightforward from your development machine. Again, we've included code to help you receive the M2M command easily. 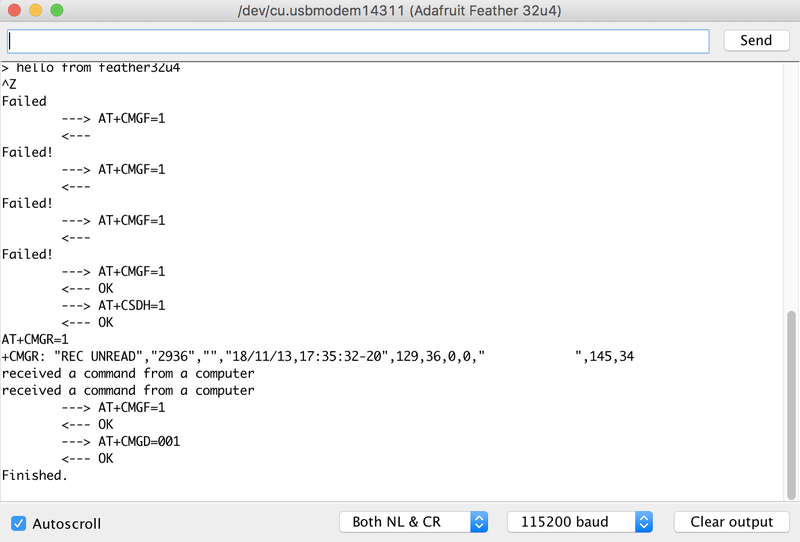 Receive a M2M command by searching for the 2936 short code in incoming SMS messages to the Adafruit Feather 32u4 FONA. To test this out, return to the Arduino IDE and make sure the Serial Monitor is still connected. And that's all there is to Machine to Machine commands. You now know how to send them from an Adafruit Feather 32u4 Fona and check their status in the console. You can also return a message from your machine and have seen how to receive it on your Feather. With those basic building blocks you're ready to build the next big IoT Thing!